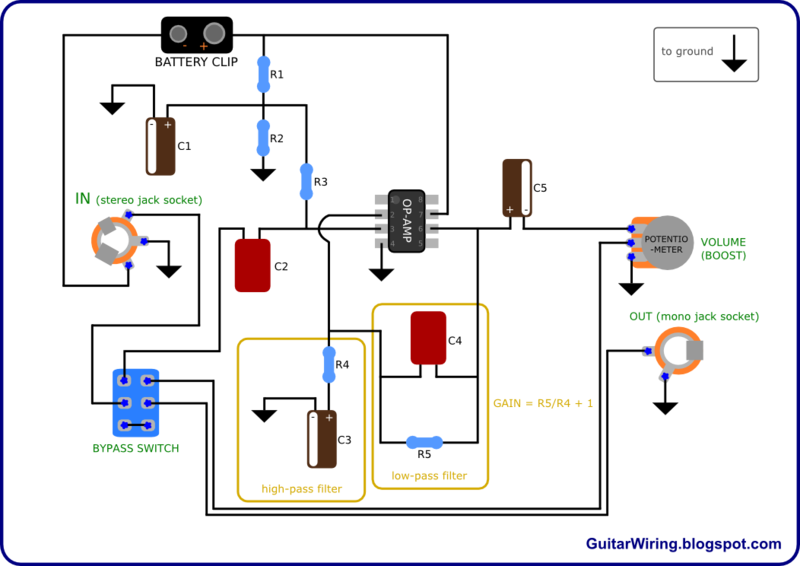 This post is about construction of op-amp based guitar boosters and preamps. You will get here some information, about how they are made, and how you can design and make your own. It's not only about just clean boosters. It's also about mid boosters, treble boosters and bass boosters. Quite useful knowledge for beginning guitar pedal makers. 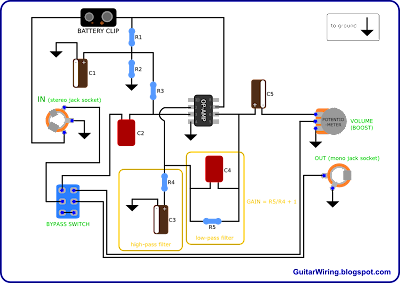 Here is the schematic of the basic op-amp based booster/preamp. It has got a bypass switch and a volume/boost control potentiometer. I also marked the places, where are frequency filters and the maximum gain control. Let's look closer at the low-pass and high-pass filters. Both are made from resistors and capacitors. Their resistors are also parts of the gain control. This is why it's good to set up your max gain as first. 21x is a really significant boost – more than enough for many guitarists. I prefer something around 6x, because I use a booster only for a quite medium crunch. A lower max gain level, means also more precise control over it – a small turn of the pot will not change the boost too dramatically. Now something about the tone. I want a mid booster. It needs well tuned low-pass and high-pass filters. The low-pass should cut-off a little bit of treble, the high-pass should cut-off a little bit of bass. These filter will define the frequency range of my pedal. The guitar amp speaker frequency range is about 70-5000Hz. My booster will have ca 200-4000Hz. This range is still quite wide, I don't want a „thin” tone. To calculate the filter cut-off levels, you can use some on-line 'RC filter calc'. It's easy to find. OK, I made my calculations. For my purposes, I will use a 330pF capacitor for the low-pass filter (120k with 330pF). It will give a 4021Hz cut-off level. For the high-pass filter, I will use a 68nF (0,068uF) cap. It will give a 195Hz cut-off level. These values means, that I will get a 195-4021Hz frequency range guitar booster, with the 11x max gain. I recommend to use the TL071. You can also look for some other IC, like the NE5534. It's got much higher power consumption, than the TL071, so it's not so good for battery based powering. If you like to play on a clean, transparent tune of your amp, the NE5534 can give you a little bit warmer tone. The input impedance is defined by the R3 resistor. 1M ohm will be enough for the guitar signal. The booster has got the stereo jack socket on the input. It's needed to make a powering circuit cut-off function. When a jack plug will be pulled-out, the pedal will not use a battery or power supply. Of course, this is only an example. You can tune your guitar booster/preamp in your own way. It can be a treble booster, as well as a bass+middle booster, or a clean booster.